Bad things can happen to patients in health care organizations that lack a true culture of safety. A Sentinel Event Alert issued by the Joint Commission Wednesday lays the blame squarely on the people who lead those organizations. The alert was issued in advance of National Patient Safety Awareness Week March 12-18 and provides steps to help health care organizations build and continuously improve their safety culture. It outlines three factors that underpin those efforts: a just culture, a reporting culture and a learning culture. It outlines 11 tenets for health care leaders to embrace efforts, including transparent and non-punitive approaches that encourage staff to report and learn from adverse events, close calls and unsafe conditions; recognizing when adverse events occur because of human error or as a result of poorly designed systems; team training; and implementation of unit-based quality and safety improvement initiatives. 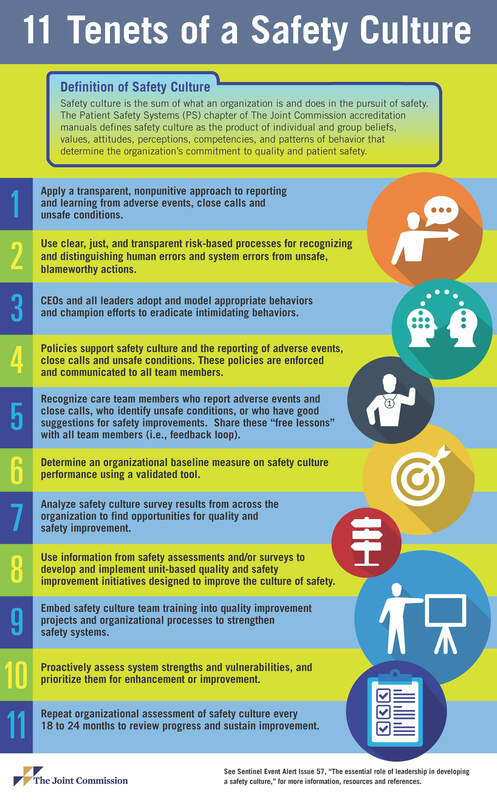 Every 18 to 24 months, leaders should schedule an organizational reassessment of safety culture to review their progress and sustain improvement, the alert urges. You can view the 11 tenets in their entirety here.